In their ‘2012 UK Service Provider Performance and Satisfaction’ perception study (1), KPMG shows unimproved (if not slightly declining) levels of buyer satisfaction with the outcome of IT outsourcing contracts compared to the same study issued in 2010. The study investigated over 630 outsourcing contracts held by 230 clients – with a significant proportion operating in the UK Financial Services industry – and indicates that a substantial percentage of the participants (46%) remain “unsatisfied or indifferent” to the quality of service provided, with concerns over delays and cost escalation particularly prominent (2, 3). Buyer satisfaction appears to fall particularly below par when measured against key indicators such as Innovation, Risk Management and Strategic Relationship. Interestingly, the ‘2012 Global Outsourcing and Insourcing Survey’ issued by Deloitte (4) tells a similar story. The survey shows that nearly half of the respondents (111 global companies across 22 primary industries) had to terminate outsourcing contracts with their vendors in the past due primarily to concerns over the quality of service. Underestimation of the effort by the vendor, sub-par vendor performance and lower than expected cost reductions are quoted as the most important factors leading to contract termination. And it is revealing that – as the same study highlights – cost reduction is no longer the sole driver to outsourcing. Other factors such as ‘gaining competitive advantage’, ‘leveraging new technologies’ and the ‘ability to partner’ are becoming centre stage. A significant element that emerges from the above studies is the clients’ increasing demand for a ‘Strategic Partnership’ with the vendor as a way to gain access to new skills and technologies while improving the quality of service in the long term. This is unsurprising in light of the findings that a strategic partnership with a specialised IT consultant is required in order to develop new systems capable of creating added value in domains where the client company faces a lack of appropriate resources (5). Outsourcing parties engaging in a trust-based, long term relationship are able to partner so as to actively cooperate in knowledge sharing, which ultimately leads to innovation and value creation (6). For example, both the KPMG and Deloitte studies highlight an increasing interest in Cloud-based solutions to reduce capital spending and increase agility. KPMG anticipates the emergence of Financial Services-oriented Cloud solutions, while Deloitte places emphasis to the advent of Platform-as-a-Service (PaaS) and Infrastructure-as-a-Service (IaaS) offerings, which enable client organisations to focus on value adding IT activities – such as writing code to solve business problems – while leaving the mechanics of infrastructure and operations to the vendor (7). It becomes therefore apparent that there is a clear opportunity in the horizon for client organisations to realise a first-mover advantage. And the know-how developed by vendors specialised in this area could certainly be leveraged to implement such a rapid transformation of the skill set required. Yet technological change and skill set upgrade may not be the only gains to be made from a ‘strategic partnership’ with an external vendor. Perhaps a more long term benefit could be process innovation through the assimilation of the vendor’s best practices – such as project and risk management methodologies. For example, software development models – such as Agile – or software-oriented process improvement approaches – such as CMMI or ITIL – have been increasingly and successfully adopted by specialised vendors in recent years. Such vendors could therefore help organisations on the client-side understand their business value. Process innovation and improvement can therefore stem from the absorption of the vendor’s best practices, which in turn requires a shift away from ‘staff augmentation’ and towards a ‘managed’ projects and services outsourcing strategy. A ‘managed’ approach is also beneficial in case the client organisation has a major skills gap, with no short-term plan to close it (8). Much rhetoric exists around the concept of ‘strategic partnership’ but it seems reasonable to suggest that its essential elements should be the existence of strong and complementary skills (i.e. both parties have something of value to contribute) and the importance of the outsourcing relationship in both partners’ long-term strategic plans (9). This provides an effective platform for an intense two-way knowledge transfer, leading to organisational learning and innovation (10). As the complexity of the outsourced work increases and the inter-dependency between the client’s and the provider’s tasks intensifies, the issue of coordination between onshore and offshore teams gains prominence as a key factor to determine success or failure of outsourced projects (11). A study on 130 offshore operations presented in the Wall Street Journal revealed that projects that paid close attention to “managing coordination” significantly outperformed those that did not (ibid). Focusing on fostering collaboration between workers separated by geography and culture is found to ease communication and create a common ground of shared knowledge between the client’s and the provider’s teams, which in turn increases the chances of success of the inter-organisational engagement. Communication is key and indeed Deloitte indicated that “increased communication” is by and large the most prevalent remedy to improve unsatisfactory deals. A coordination strategy to develop integration mechanisms aimed at minimising and bridging the communication gaps is therefore essential. Evidence from in-depth case studies on the subject has pointed to the importance of integration mechanisms such as establishing informal linkages between onshore and offshore staff through frequent, proactive travel and cross-training. Other integration mechanisms include the application of disciplined software processes – such as CMMI – and the setting up of onshore liaison roles dedicated to interfacing with the offshore team (12). The need to manage coordination across teams is arguably particularly relevant to the provision of custom software solutions. Custom software systems – such as a bespoke system to capture OTC derivative trades or a front-end tool to manage a bank-specific client on-boarding process – have been found to facilitate competitive moves and enable differentiation of the firm (13). Yet the project-based provision of custom software solutions is uniquely more complex than other standardised activities as it implies an intense knowledge transfer between the client and the supplier’s teams. This is where an effective coordination strategy can play a key role. Intense knowledge transfer, as hinted above, requires close and continuous interactions between the client’s and the supplier’s team, face-to-face contacts and – crucially – trust (14). It is in this context that geographical proximity between the outsourcing partners can play an important role as it reduces communication and cultural barriers. The choice about location is therefore an important one. The nearshore option emerged as a reaction to the difficulties implied by offshoring – especially those imposed by distance. While still providing significant cost savings compared to ‘in-house’ or ‘on-shore’ options, the nearshore destination also lowers communication barriers through easier face-to-face contacts, similar time zones, and closeness in culture and/or language (15). Cultural and physical proximity is particularly beneficial to the provision of complex and bespoke software solutions, whereby – as discussed – an in-depth working relationship between the outsourcing parties needs to be established throughout the project (16). A number of nearshore outsourcing locations have therefore emerged in recent years, which have expanded considerably the outsourcing menu. 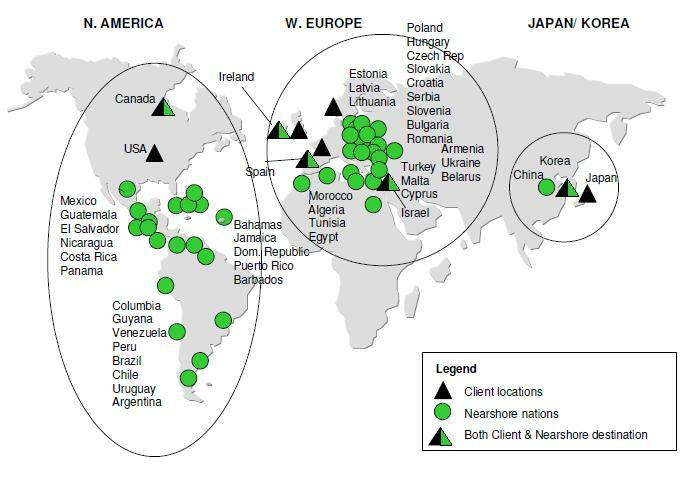 In the European market, nearshore locations are clustered around Eastern Europe and Northern Africa, as Figure 2 shows. Ireland and Spain are two notable exceptions in Western Europe which provide even closer cultural proximity to clients and – particularly in the case of Spain – a large availability of skilled workforce (17). Geographical distance is indeed an important factor in models of the outsourcing location decision, alongside other factors such as the quality of the country’s human capital and the physical infrastructure (18). This is why geography matters in the context of strategic business services outsourcing as continuous face-to-face interactions and cultural fit are advantaged compared to the vast availability of cheap, faceless labour in remote locations. As suggested by the market studies referenced in this report, the IT outsourcing phenomenon, which has been fuelled in recent years by the pursue of cost minimisation and financial flexibility, is now evolving as outsourcers are increasingly looking for more strategic and value-adding benefits – such as innovation and competitive edge. Insights presented in this report place emphasis on issues such as technological and process spill-over between client and vendor, managing teamwork and cultural and physical proximity as a way to obtain more from the outsourcing engagement. There is of course no magic recipe that companies can follow to secure outsourcing success under existing or future conditions. Yet what seems to be clear is that a shift in inter-organisational strategy is required to harness the potential of IT outsourcing to deliver an enduring business advantage. 19. Miiken LTD. 2013. 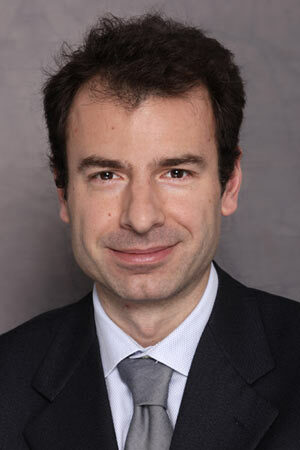 “European nearshore IT coverage of the Banking sector”.